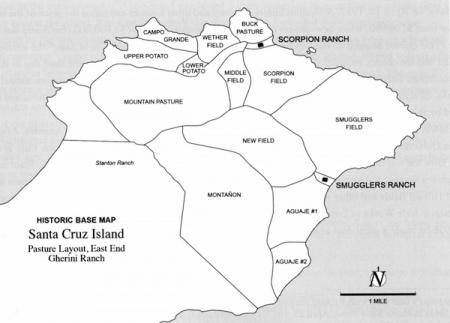 Campo Grande, Santa Cruz Island, historic hay field located on the northern mesa of the island's east end. The Campo Grande was the location of one of the island's five airstrips (Campo Grande, above San Pedro Point, Main Ranch, Christy Ranch, the Point [West End]). 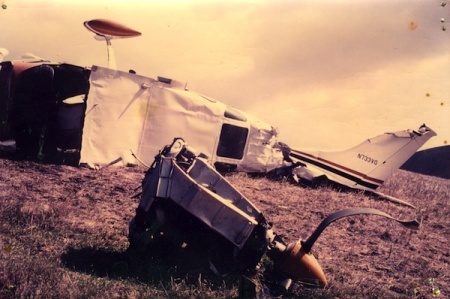 In February, 1984, island employee, Pete Petersen, along with another passenger, survived a plane crash on the Campo Grande airstrip. Petersen suffered from severe internal injuries, and the crash ended his employment on Santa Cruz Island. 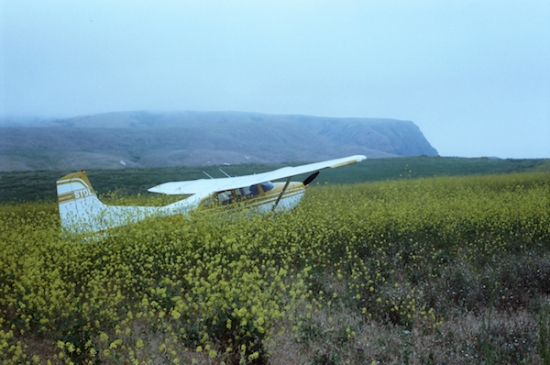 The Campo Grande airstrip served the island for more than half-a-century until it was closed by Channel Islands National Park in the late 1990s. Finally as we swung west along the coast of Santa Cruz Island I was able to pick out many familiar spots and landmarks. There was Pedro Point at the extreme eastern end of the island, the canyon where the Scorpion Ranch is located. The buildings were not visible because of the high cliffs and the narrowness of the canyon in which they are located, El Campo Grande on the mesa above the ranch where we used to raise hay, and the Montagnon which is the highest portion of the ridge from which Santa Cruz may have gotten it's name. This page was last edited on 20 March 2017, at 07:36.